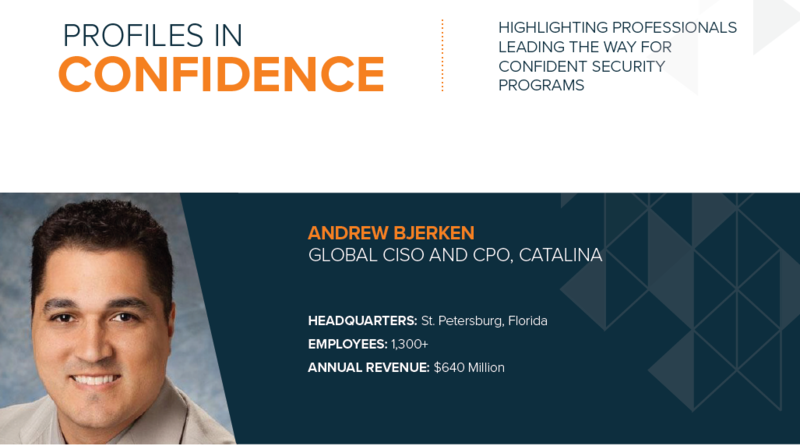 Currently the Global CISO and CPO of Catalina, a big data company focusing on shopper history, Andrew Bjerken possess a strikingly unique background. Starting his career in the Air Force as an electronic warfare officer and then transitioning to the red team, Bjerken tested physical and cyber security controls across a multitude of bases and systems. Along with his team, they spent their time trying to break into networks and facilities to exfiltrate data. They would then brief commanders on what kind of unclassified/classified information they were able to either exfiltrate or piece together. This work exemplified Bjerken’s first plays into information security and sparked his interest in replicating his Air Force work in his transition to the corporate world. Honesty ranks high on Bjerken’s approach to communication with senior leadership. He is consistently open and honest about where challenges exist within his information security and privacy program and what his needs are to fulfill business requirements. Most importantly, he clearly articulates his strategic roadmap to show where they are and where they need to be so allocated budget does not get wasted. According to Bjerken, key traits of success for CISOs include effective communication, a strategic approach, and being passionate.